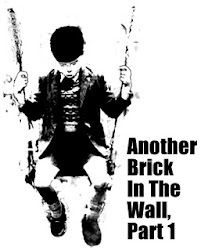 Another Brick in the Wall: Going for two third? PPBM is only 25,000 strong and hardly pose a threat to UMNO's election machinery. They will not divulge their true membership figure as it had been a let down after their propaganda that millions from UMNO crossed over. Strategically, UMNO is in a position to do frontal attacks on opposition stronghold. Winning or losing is another story but they have the bullets to do so. PPBM may be crumbling as Mahathir's influence wane but Khairy Jamaluddin warned, they should not be ignored. It has double meaning but lets just let it lay. EVERYONE was expecting Datuk Seri Najib Tun Razak to beat the war drums at the Umno general assembly. What they did not expect was that the Umno president would start banging it barely 10 minutes into his presidential speech. From then on, it was bang, bang, bang all the way till the end. And the delegates lapped it up – the fierce talk, the jabs at the Opposition, the rallying cry and the confidence boosting. Najib has often been described as a “wartime president” because he took over Umno when the war between the ruling and opposition coalitions was at its most intense. He is now in war mode. It was a highly charged political speech, a war speech to fire up the 2,700-plus delegates who resembled a sea of red at Dewan Merdeka. He was basically telling them that the party intends to win big in the general election. He did not spare the drama either, telling the delegates that the next general election is not just another election but that it would “determine the compass of our struggle”. He also turned up the emotions when he told the audience that the party needs to win in order to defend the sovereignty of the Malay Rulers, the stability of the nation for future generations and, of course, the sanctity of Islam. “He was setting a clear narrative for GE14. He spent a good deal of time attacking the Opposition and debunking the falsehoods spread by them over the years,” said political commentator Amir Fareed Rahim. Umno started using graphics and videos to accompany the presidential speech several years ago. It was pretty clumsy in the beginning but they have mastered it using a superb high-definition giant screen that stretches across the top of the stage. In fact, Umno general assemblies have not been the same since Datuk Seri Rauf Yusoh took over as the party’s executive secretary – everything seems bigger, grander and more organised. There were boos from the audience each time pictures of the Opposition leaders, especially Tun Dr Mahathir Mohamad and the DAP father-and-son, appeared on the giant screen. DAP and Parti Pribumi are now the big enemies while PAS has been relegated to “friendly enemy” status. The attacks on Dr Mahathir had begun last year but in a rather oblique way. They had referred to him as “a certain leader” or the “old man”. But now that he is the leader of the Opposition, they feel free to criticise him. Najib referred to the former premier by his name while pointing out all the U-turns the elder man has made since joining the Opposition. Who would have imagined a day when the man considered the greatest prime minister Malaysia ever had would become Umno’s Enemy No. 1? They put Dr Mahathir’s face against a picture of an old junk boat to illustrate that the Opposition is being led by a 92-year-old man. Najib slammed Parti Pribumi for working with DAP which he said is anti-Malay and anti-Islam. He said Parti Pribumi could not even organise its party AGM but is trying to tell Barisan Nasional how to do its work and he labelled Dr Mahathir as “Bapa Segala Tol” (father of tolls) for all the lopsided toll highway agreements. “It’s clear that Umno sees Parti Pribumi as a rival, going by the systematic attack,” said Amir. Najib likened Pakatan Harapan to a ship with four captains and asked, “how are they going to run the country”. Datuk Seri Anwar Ibrahim also made a cameo appearance when a picture of the now famous hospital visit appeared on the screen. But Najib assured his party that it was just a friendly overture and that his party will continue to “lawan tetap lawan”or fight it out with PKR. Najib’s strength is that he has managed to stay focused and continue with what he has to do as prime minister in the midst of all the attacks aimed at him and his party. But in politics, the standing of a party is relative to the strengths and weaknesses of the opposing side. Najib’s party and coalition looks much more steady today because the other side is unable to sort out its differences, and its modus operandi of blame and accuse has started to lose credibility. “Although a big part of his speech was about poking holes in the Opposition, his main aim is to create an atmosphere of confidence for the general election. You need to have the winning mentality in order to win. “It was important for him to quash the opposition nonsense that Malaysia is a failed state and we are going bankrupt. “As Najib pointed out, Malaysia has been named the top emerging economy in the region with a growth rate of 6.2%,” said supreme council member and Finance Minister II Datuk Johari Ghani. Najib also introduced a new term – persuadable voters. This group is apparently different from the middle-ground voters and some think he is referring to PAS supporters who can be persuaded to support Umno. Was that why the cries of “Allahu Akbar” – something usually associated with PAS gatherings – rang out a total of six times throughout Najib’s speech? TUN Dr Mahathir Mohamad, who as Umno president lamented that Melayu mudah lupa (Malays forget easily), is the one who has actually forgotten the party’s cause, said Datuk Seri Najib Tun Razak. Zeroing his attack against the Opposition squarely on Dr Maha­thir, Najib said the former prime minister and Umno president was a “Melayu mudah lupa”. Dr Mahathir’s famous words, said Najib in his presidential address at the Umno general assembly yesterday, actually reflected on himself as the former leader who had abandoned the party’s cause for personal greed and agenda. “It is strange that some are willing to be led by an individual in his sunset years whereas former president (Robert) Mugabe of Zimbabwe, who is the same age, has been rejected by his people,” he said. 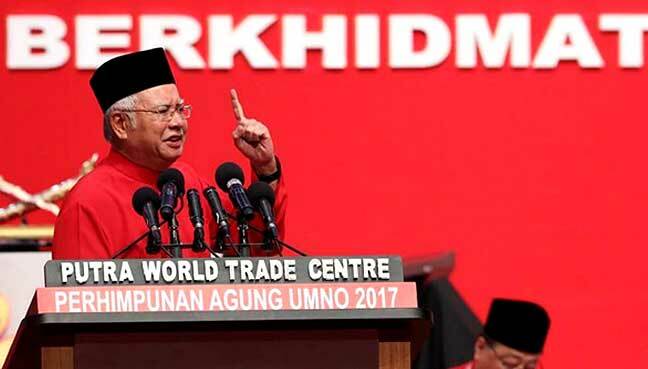 Najib reminded the delegates that it was on this very stage at the Putra World Trade Centre that Dr Mahathir had talked about Melayu mudah lupa. “But for us, he crossed the line when he became willing to join forces with his own political enemies and enemies of his own principles for decades,” he added. Najib said regardless of ethnicity, the Government considered all of the country’s 32 million-strong population to be “children of 1Malaysia”. “Strangely, one former Umno president, who is now the main leader of an Opposition party, is still trapped in a colonial mindset to the extent that he is willing to scorn people of Bugis ancestry,” he added. Dr Mahathir allegedly claimed Malaysia had a leader who was descended from “Bugis pirates” during the Love Malaysia, End Kleptocracy rally on Oct 14. Najib said this was not what Umno was about as it celebrated the ethnic diversity of the Malay stock. He also questioned the democracy DAP supposedly fought for when only 54% of the delegates attended its central executive committee re-election. “Umno has made seven amendments to its constitutions since 2009 to allow over 150,000 members to elect the party leadership. “In comparison, for the past 50 years, DAP has been dominated by its adviser and father-son dynasty,” he noted. As for Parti Pribumi Bersatu Malaysia, Najib questioned the party’s ability to lead when it could not even manage its meetings, adding that it was clear that it was being used as a “tool by DAP, which aimed to turn the country into a fully secular state”. On Umno-PAS relations, he said Umno’s stand on this was clear and they were for the interests of the Muslim community. And there is a piece of good news for BN today. KUALA LUMPUR: Oversight of the Election Commission’s redelineation exercise was the exclusive duty of Parliament, not the judiciary, ruled the High Court which dismissed the Selangor government’s judicial review. High Court Justice Azizul Azmi Adnan said any intervention by the judiciary would overstep the boundary of separation of powers. The judge cited prior Court of Appeal decisions which found the EC’s recommendations on a redelineation exercise, which still had to be passed by Parliament, were not legally binding and thus did not adversely affect the state government’s legal rights. Justice Azizul said the state government’s claim that electoral roll was flawed as it did not have the addresses of 136,272 voters did not hold water. “It is likely on the balance of probabilities that the addresses were available to the Commission when the locality codes were assigned,” he said. He disagreed with the state government’s claim that there was insufficient information about the exercise, which stopped voters from making meaningful repre­sentation against it. He ruled that though the EC fell short of Australia and the United King­dom’s standards for trans­parency, what qualified as adequate information was a far lower ­standard to adhere to, which had been met. “For these reasons, I dismiss the entire application with no order as to cost,” he said. A stay was later granted pending appeal by the state government. The courtroom was packed, with state assemblymen and politicians including Selangor Mentri Besar Datuk Seri Azmin Ali and PKR’s Batu MP Tian Chua. Senior federal counsel Datuk Amarjeet Singh acted for the EC, while lawyer Datuk S. Ambiga ­represented the state government. The Selangor government had filed the judicial review on Oct 19 last year, naming the EC, its chairman Datuk Seri Mohd Hashim Abdullah and secretary Datuk Abdul Ghani Salleh as respondents. It wanted the court to quash the EC’s notice and an order to direct it to publish a fresh notice on the proposed exercise. The state government also wanted a declaration that the notice was lacking in details, leading to voters, local authorities or the state government being unable to exercise their constitutional right to file representations. The challenge was based on claims that the EC acted unconstitutionally in the redelineation exercise by using a defective electoral roll. Taken all this into account, what can be deduced? No one dare make over optimistic prediction in the light of popular perception that the next election could be a toss-up with the percentage of fence-seaters high. Related to BN chance in the nect GE and socisl media, read Malaysia Outlook here. However, currently Sabah and Sarawak is under wrap for Najib, and it may not necessarily BN, only Najib. States said to fall had a change of tide. Kedah is all auta. Joceline is not saying it but is she thinking of two third majority for BN? Maybe its too early to call. Good. Then UMNO should call the general election now so the rakyat can vote for a new government. The loser should, of course, practice moderation. Two-thirds? Any tiga suku will agree our illustrious and brave leader will get two-thirds or even one-third! Of what I dunno-lah.